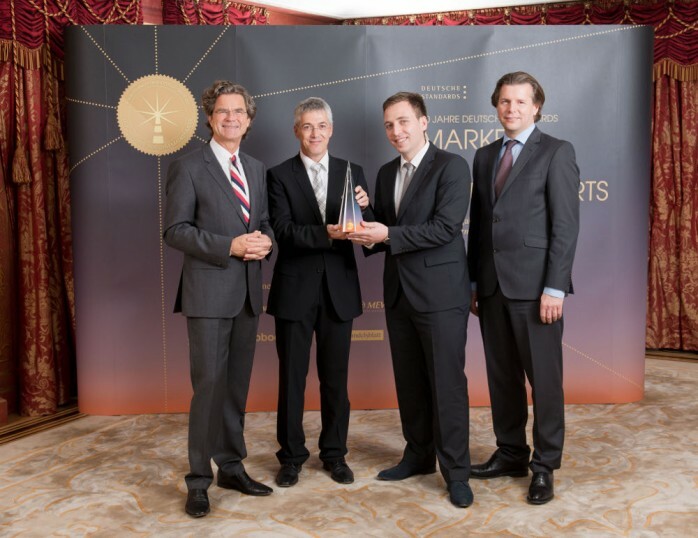 On Thursday evening, 22th November 2012 the pinnacle of German industrial brands were celebrated with word and image at the tenth “Brands of the Century” ceremony held at Berlin’s Hotel Adlon Kempinski. The standard reference work “German Standards – Brands of the Century” provides information on companies that help form the backbone of the “Made in Germany” brand. 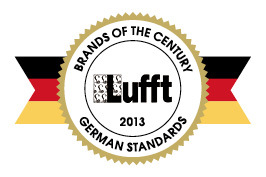 G. Lufft GmbH was named a “Brand of the Century” as part of the 10th anniversary edition of the brand lexicon. Book publisher Dr. Florian Langenscheidt was on hand to give the German Standards Brand Prize to Lufft CEO Klaus Hirzel who expressed his gratitude, especially for the recognition of 130 years of Lufft quality and innovations. The history of Lufft began in 1881 as master optician Gotthilf Lufft founded a machine shop to build barometers according to a simple, but ingenious principle: measure barometric pressure with a metal membrane box that would expand and contract as the ambient pressure changed. Lufft’s barometers filled an existing gap in the market and by the turn of the century he had become the market leader in Germany. Over time, Lufft barometers became successful on an international level as well. Besides its climate measurement instruments for domestic use, Lufft was able to build its reputation for its service to industry, the craft trades and research. Lufft instruments were used on adventurous expeditions to Nanga Parbat in the Himalayas or in Greenland, for example. Throughout its history, the family business had to face a variety of challenges, both to the business and in the production of new measuring devices. Today the Lufft brand stands for industrial climate measurement and professional environmental monitoring technology. Lufft now offers a broad and unique range of devices, data collectors and sensors for measuring physical variables. The Swabian company has sales around the world and subsidiaries in the U.S. and China. 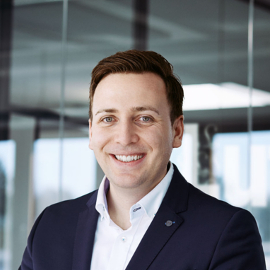 Currently a total of 80 employees work in development, production, sales and marketing departments at Lufft and embody the company’s principle of “Tradition and Innovation”, as they constantly seek to hone the precision of Lufft instruments. Production will start shortly of a new hand-held device, called the “world’s most accurate hand-held instrument for temperature measurement,” with an accuracy of +/- 0.00 “x”. The new series of hand-held devices will be on the market in 2013. More about the history of Lufft can be found in the “Brands of the Century” special edition “Guiding Lights in an Ocean of Brands.” Renowned media designer Mike Meiré was responsible for the design of the book which portrays specific brands and the story behind them. In addition to Lufft, brands such as tissue maker Tempo, appliance brand Miele and the Steiff teddy bear are presented. Few days ago I came over a old pocket Barometer/ altimeter, and are there some place I can find manual for how to use? COMPENS no 31981 Lufft, outer scale in meter, inner goes from 60 to 78. Unfortunately we do not have a manual for the pocket barometer. Thanks for your interest. Sounds like a great discovery of a mechanic Lufft altimeter. I guess it was produced before the year 1945. Hope it will stay in such a good condition for many more years. Hi…have an old compens altimeter…Outer scale is from 0 to 5000 meters, inner scale is from 40 to 80 meters? How does one read this instrument? Serial # is 2095…thnx for any help you can give me. I have inherited a mint condition Lufft model 13969 that my Father in law bought in Germany during WWII. What’s it worth and how do you operate it? I think it’s worth about 100 € but I would compare the prices on the internet, where you can find some old Lufft devices on different web shops and auctions. Can you please send me a more detailed explanation or a picture of the device, then I can see how it works. I got from my father a old Lufft altimeter scale 0 to 3000 m . How old is it ? And how much is it worth ? And on what sort of plane where there used ? Could you please send us more product details (serial number, photo) to pr@lufft.com.